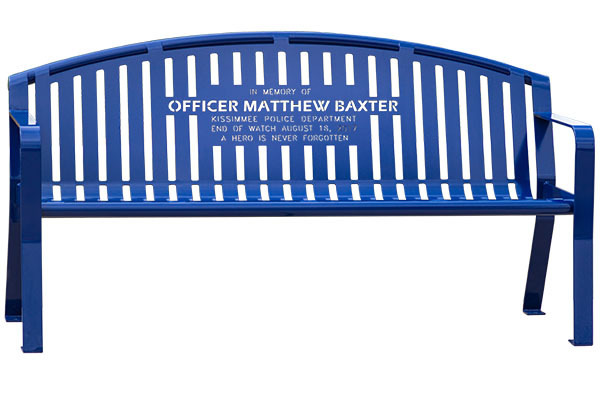 The Metal Police Bench is a beautiful way to honor fallen officers. Place the bench at a local park, police station, dedicated site, and more. 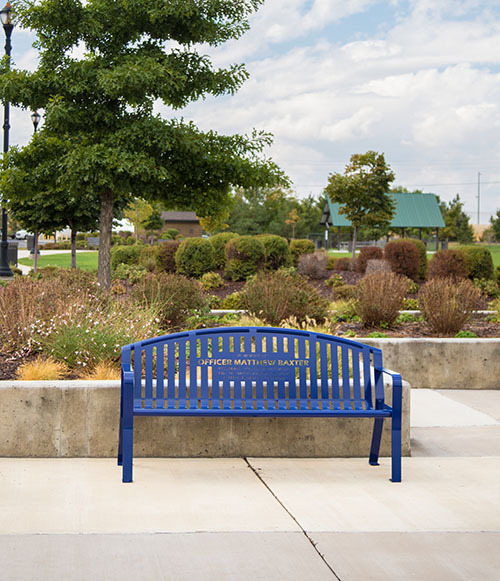 To get started on a police memorial bench, call today at (801) 414-1724. Here is a closer look of how we design the custom bench. Our team will work with you from initial design to final product. To get started on the bench, first send us any ideas you have for the bench design. This can be an AI or Photoshop File, Word Document, or sketches on a notepad. 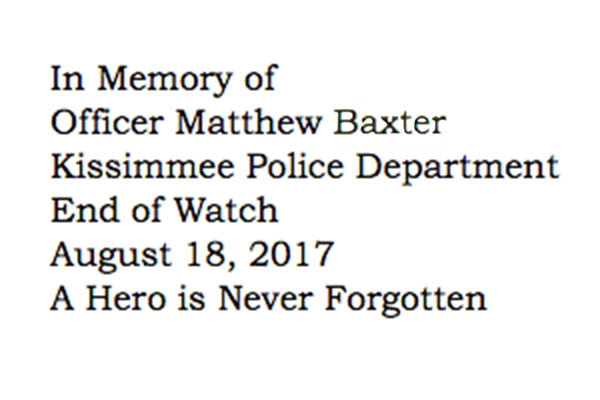 For this bench, we were sent an email with the inscription that they wanted incorporated into Officer Matthew Baxter’s Bench. 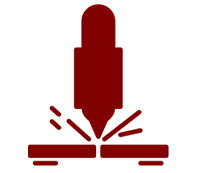 Once we have received your design ideas, our team will take them and create a proof of the bench. This will be a realistic representation of how the finished metal police bench will look. The proof will be emailed to you for final approval before the bench is sent to manufacturing. The bench body is first laser cut from a single sheet of metal. It is then bent into shape and legs are welded on. Powder coat is then applied to the bench to provide a beautiful, lustrous finish. For this bench, the color Cobalt Blue was used. The bench was then shipped out to Florida! At Smith Steelworks, we have worked tirelessly to create benches that will withstand the test of time. Each custom bench is produced from a single sheet of metal. This metal is laser cut and bent into shape. Fewer welds are needed with this process; resulting in less points of delicateness. The welds that are used are fully welded to prevent moisture build up. Besides providing excellent color, powder coating also creates a weatherproof finish. The layer is durable and resistant to chips and scratches. Stainless steel powder coated legs prevent rust and corrosion from spreading up the police metal bench. Why do we laser cut our metal benches? Laser cutting allows for precise cuts with extreme detail. This gives our team the creative liberty to create all types of bench projects. Face profiles, inscriptions, logos, and sceneries are popular options on the bench back. The metal police bench is a beautiful way to bring friends and family together. 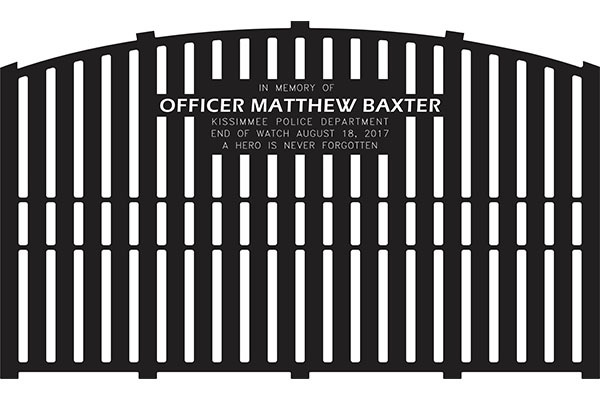 For this bench, it is a place that Officer Baxter’s family, friends, fellow police officers, and other community can gather to honor his life and sacrifice. Each memorial bench we create touches our hearts. 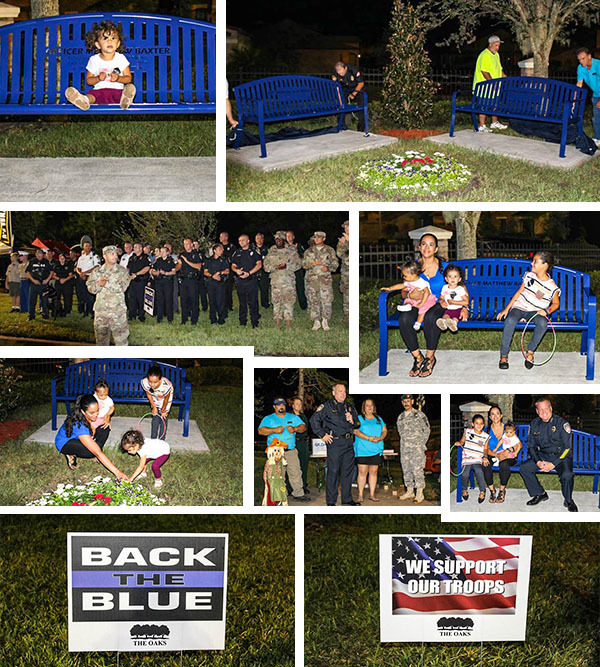 We feel so honored to have created this bench for one of Kissimmee Police Department’s fallen officers.